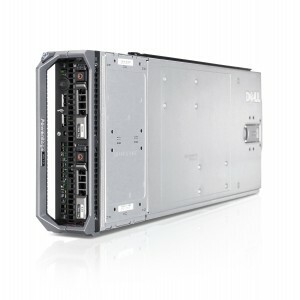 Accomplish more with a refurbished Dell PowerEdge M620 from Bargain Hardware. This dual-socket blade server has been designed for maximum performance and extreme density and power efficiency. Ideal for taxing workloads including database and virtual environments. With an ideal blend of performance, density, efficiency, performance and scalability the M620 delivers unprecedented memory and outstanding performance with no compromise on enterprise-class features. The M620 offers a maximum memory capacity of 968GB DDR3 RAM over 24 RDIMMs, with scalable I/O capabilities. Powered by two Intel® Xeon® E5-2600 or E5-2600 v2 processors and Dell’s unique Select Network Adapter (Flexible NIC technology) the M620 provides the performance you require and allows you to allocate your network throughput to match your specific needs. Dell’s OpenManage systems management portfolio includes iDRAC7 (Integrated Dell Remote Access Controller 7), which is an embedded feature that allows IT admins to manage the servers in a physical, virtual, local or remote environment. The M620 has bays for two 2.5” hot-swappable SAS or SATA Hard Drives or SSDs and a maximum storage capacity of 2.4TB. Bargain Hardware stocks components to equip a huge variety of configurations for the refurbished Dell PowerEdge M620 and with the Configure-To-Order (CTO) hardware options, you can build your new system on-spec and on-budget for Bargain Hardware to deliver on-time. If you require any assistance with your purchase, then please don’t hesitate to contact our sales team using the contact us button above or the phone number at the bottom of the page.